LaN Brooklyn 에서 RhinoScript 와 고급 레벨 Grasshopper 강의 시리즈를 기획하였습니다. StudioMode의 Gil Akos씨와 Ronnie Parsons씨가 그들의 최근 패러메트릭 디자인 프로젝트에 대해 발표합니다. 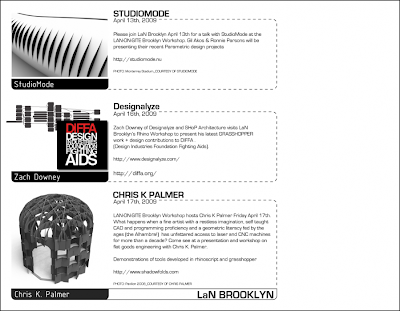 Zach Downey 씨가 그의 최근 DIFFA (Design Industries Foundation Fighting Aids) 프로젝트의 Grasshopper 작업과 디자인에 대해 발표합니다. Chris 씨는 그의 최근 프로젝트에 대해 이야기하고, RhinoScript + Grasshopper 로 개발한 툴을 시연할 예정입니다. 자세한 정보는 LaN의 James Coleman 씨에게 문의하세요.